In 1818, Barratta first described aniridia (Greek for absence of the iris). Aniridia is a rare, bilateral, panophthalmic disorder, of which iris hypoplasia is the most striking feature (see image below). Approximately 85% of cases are familial (designated AN1) with autosomal dominant inheritance with complete penetrance but variable expressivity. These familial cases usually have isolated ocular involvement. The 15% of cases that are sporadic have a deletion or mutation on the short arm of chromosome 11. The same deletion is responsible for the development of Wilms tumor (nephroblastoma). The exact pathogenesis of aniridia is unknown. After early reports of ocular colobomas in patients with aniridia, some authors proposed that it is a colobomatous disorder. 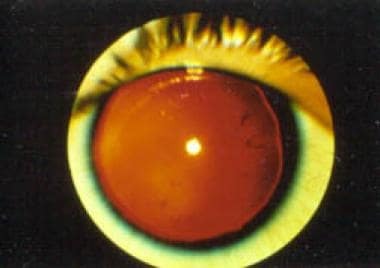 Others attributed it to a failure of mesodermal development with involvement of the rim of the optic cup, causing iris hypoplasia. Still others advocated the neuroectodermal theory, which links the presence of retinal anomalies and iris muscular hypoplasia to a developmental failure of neuroectoderm. Aniridia is a very rare disorder. According to a population-based study in Michigan, it has been estimated to affect approximately 1 per 61,000 newborns. A more recent study from Denmark reported the incidence as 1 per 96,000 live births. Aniridia itself is not a lethal disorder. However, miscarriages and a stillborn child have been the only results of a consanguineous mating between individuals with aniridia. A homozygous mutation of the aniridia gene may possibly be lethal. The morbidity of aniridia is significant because of the decreased vision and nystagmus. The incidence of aniridia is equal in males and females. Aniridia is a congenital disorder apparent at birth. It is never acquired. Edén U, Riise R, Tornqvist K. Corneal involvement in congenital aniridia. Cornea. 2010 Oct. 29(10):1096-102. [Medline]. Brémond-Gignac D, Bitoun P, Reis LM, Copin H, Murray JC, Semina EV. Identification of dominant FOXE3 and PAX6 mutations in patients with congenital cataract and aniridia. Mol Vis. 2010 Aug 22. 16:1705-11. [Medline]. [Full Text]. Nelson LB, Spaeth GL, Nowinski TS, et al. Aniridia. A review. Surv Ophthalmol. 1984 May-Jun. 28(6):621-42. [Medline]. Brauner SC, Walton DS, Chen TC. Aniridia. Int Ophthalmol Clin. 2008 Spring. 48(2):79-85. [Medline]. Callahan A. Aniridia with ectopia lentis and secondary glaucoma. Am J Ophthalmol. 1949. 32:28. Chen TC, Walton DS. Goniosurgery for prevention of aniridic glaucoma. Arch Ophthalmol. 1999 Sep. 117(9):1144-8. [Medline]. Edén U, Iggman D, Riise R, Tornqvist K. Epidemiology of aniridia in Sweden and Norway. Acta Ophthalmol. 2008 May 19. [Medline]. Grant WM, Walton DS. Progressive changes in the angle in congenital aniridia, with development of glaucoma. Am J Ophthalmol. 1974 Nov. 78(5):842-7. [Medline]. Hamming N, Wilensky J. Persistent pupillary membrane associated with aniridia. Am J Ophthalmol. 1978 Jul. 86(1):118-20. [Medline]. Hittner HM, Riccardi VM, Ferrell RE, et al. Variable expressivity in autosomal dominant aniridia by clinical, electrophysiologic, and angiographic criteria. Am J Ophthalmol. 1980 Apr. 89(4):531-9. [Medline]. Jastaneiah S, Al-Rajhi AA. Association of aniridia and dry eyes. Ophthalmology. 2005 Sep. 112(9):1535-40. [Medline]. Jesberg DO. Aniridia with retinal lipid deposits. Arch Ophthalmol. 1962 Sep. 68:331-6. [Medline]. Koroma BM, Yang JM, Sundin OH. The Pax-6 homeobox gene is expressed throughout the corneal and conjunctival epithelia. Invest Ophthalmol Vis Sci. 1997 Jan. 38(1):108-20. [Medline]. Kremer I, Rajpal RK, Rapuano CJ, et al. Results of penetrating keratoplasty in aniridia. Am J Ophthalmol. 1993 Mar 15. 115(3):317-20. [Medline]. Layman PR, Anderson DR, Flynn JT. Frequent occurrence of hypoplastic optic disks in patients with aniridia. Am J Ophthalmol. 1974 Apr. 77(4):513-6. [Medline]. Mackman G, Brightbill FS, Optiz JM. Corneal changes in aniridia. Am J Ophthalmol. 1979 Apr. 87(4):497-502. [Medline]. Margo CE. Congenital aniridia: a histopathologic study of the anterior segment in children. J Pediatr Ophthalmol Strabismus. 1983 Sep-Oct. 20(5):192-8. [Medline]. Menezo JL, Martinez-Costa R, Cisneros A, et al. Implantation of iris devices in congenital and traumatic aniridias: surgery solutions and complications. Eur J Ophthalmol. 2005 Jul-Aug. 15(4):451-7. [Medline]. Nishida K, Kinoshita S, Ohashi Y, et al. Ocular surface abnormalities in aniridia. Am J Ophthalmol. 1995 Sep. 120(3):368-75. [Medline]. Ramaesh K, Ramaesh T, Dutton GN, et al. Evolving concepts on the pathogenic mechanisms of aniridia related keratopathy. Int J Biochem Cell Biol. 2005 Mar. 37(3):547-57. [Medline]. Warburg M, Mikkelsen M, Andersen SR, et al. Aniridia and interstitial deletion of the short arm of chromosome 11. Metab Pediatr Ophthalmol. 1980. 4(2):97-102. [Medline]. Wiggins RE Jr, Tomey KF. The results of glaucoma surgery in aniridia. Arch Ophthalmol. 1992 Apr. 110(4):503-5. [Medline].